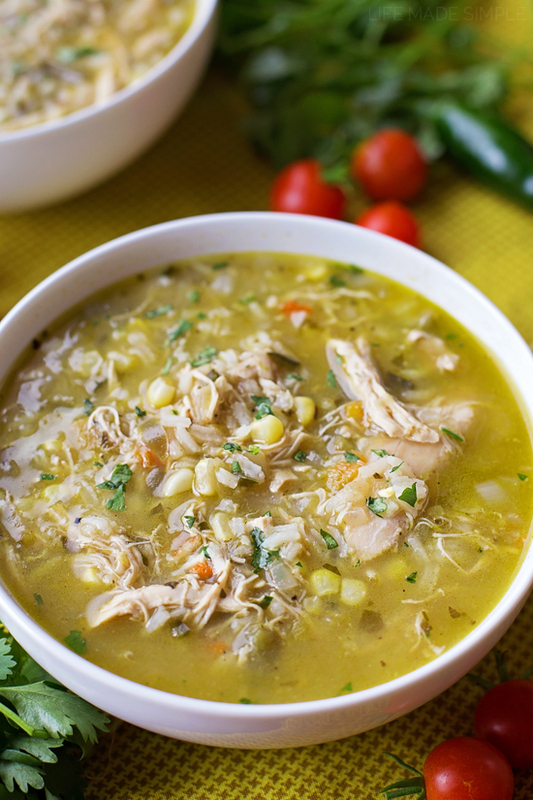 I like to think of this warm & cozy chicken and hatch chile stew as the perfect rainy day meal! We’ve had a few cold spells over the past few weeks, but the weather is still in the 80’s and 90’s. I’m dying guys. I want it to be sweater/boot/hot cocoa weather already! Who’s with me?! So when it stormed the other day we headed to the store, grabbed a rotisserie chicken and made a huge pot of this stew! I don’t know about you, but I love when it’s hatch chile season. Our local grocery store roasts them and sells them along with all of their hatch chile goodies and I can’t ever seem to get enough (watch out because next year I’m gonna make a killer loaf of bread with them in it)! I chopped some of ours up and added them to the chile verde base, which added a nice little kick. Normally I don’t think of them as being very spicy (the canned ones are very mild) but the fresh ones were amazing!! I couldn’t help but go back for seconds. I needed more!! Seriously though, we licked our bowls clean! My husband loved the addition of the rice and so did I (I contemplated adding beans but then thought… that’s basically this soup), it made it a bit more hearty and filling. Plus I didn’t feel like I had to make anything else to go along with it (I just sliced up some fruit and a threw together a side salad). Of course if you want to, I’d highly suggest my buttermilk cornbread– it’s the best! 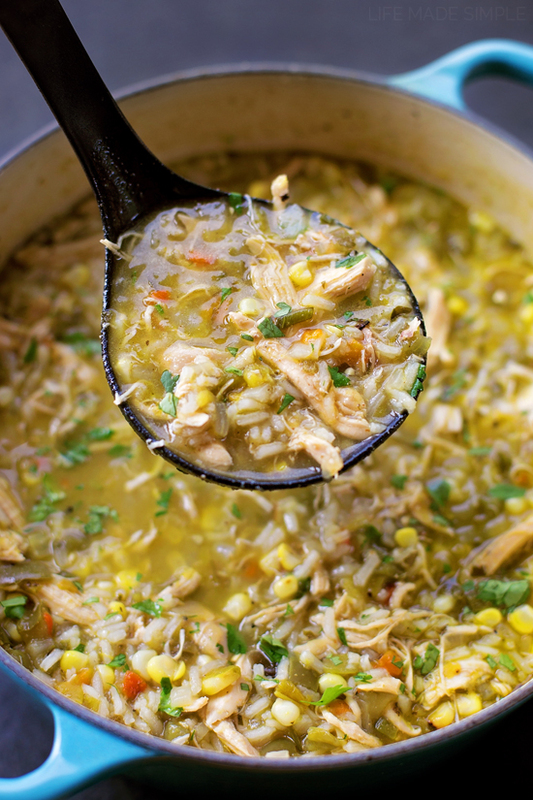 Next time you’re at the store, grab a rotisserie chicken, some corn, chile verde & hatch chiles and make this stew! You won’t regret it, I promise! 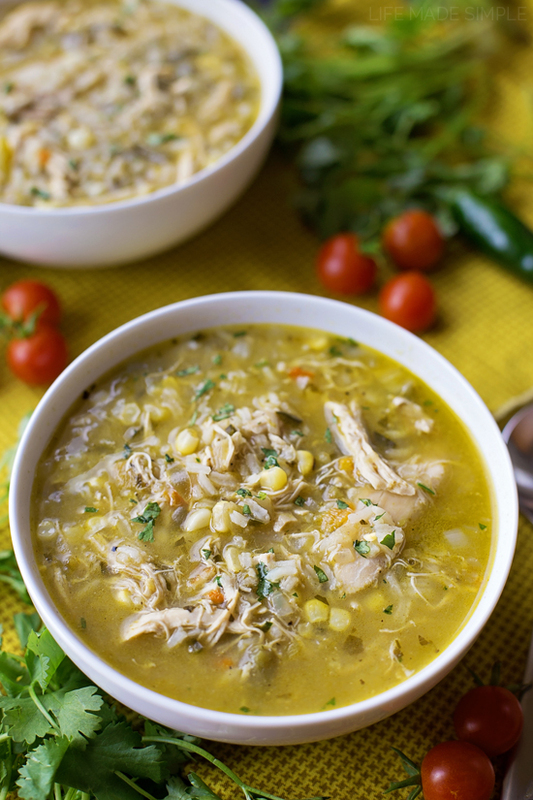 This bold & flavorful chicken and hatch chile stew is ready to go in just 1 hour! It's loaded with shredded chicken, fresh corn, rice and of course, hatch chiles! In a large large stock pot or Dutch oven set over medium heat, heat the olive oil. When the oil is hot, add the onion and corn, cook until fragrant, about 6 minutes. Add the garlic and cook for 1 minute, then sprinkle in the coriander, cumin, paprika, salt and pepper and continue stirring/cooking for an additional minute or so. Add the hatch chiles, salsa verde, chicken stock, water and lime juice. Turn the heat up and bring the mixture to a boil. Add the chicken and cilantro, simmer for 20 minutes. Pour in the rice, cook until tender, about 15 minutes or so. Garnish and serve immediately. This recipe looks amazing! 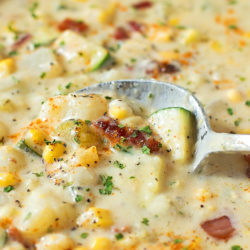 Found this recipe and you through Pinterest (be still my heart) and I’m in love with your site. Easy to read and easy to understand. Like you, I am a self-taught cook/baker and have learned most from my mom. 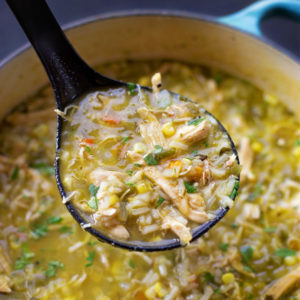 I look forward to making lots from your site starting with chicken and hatch chile soup. Thanks! Would using Barley or Wild Rice boost this recipe for you or anyone else ? In my Pork Green Chile, I’ve used Mexical corn from Kuners. Those would both work! Our toddler doesn’t like the texture of either so I generally don’t use them in the main dish, but they’d be really good in this. And yes, any corn will do, hominy would be good too when fresh corn is out of season. So happy to hear that! Thanks for giving it a try Boni! Thank you for mentioning Hatch Green Chile. We would love to send you a free box of our Hatch Green Chile to say thank you. If you’re interested, please send me an email with your heat preference. How many ounces of hatch chiles would I need, I already have pre-diced chiles! I’d say around 1/3 cup. Hope that helps! Made this today and it is delicious! boyfriend loved it❤️ I used just a bit less coriander. This recipe was a big hit at mi casa!!! My boys were actually fussin’ to get the last drop! So good… thanks for sharing???????????????? You are welcome! Happy to hear your boys loved it!! Thanks for sharing your recipe! I made it today pretty much as written and it was EXCELLENT. I live in the Midwest and always scour the markets in August for Hatch chilies. If they’d roast them for me too, I’d be i heaven! Thanks again! The first time I made this I made it as written. Hatch chilies were in season & the ones I used turned out to be quite spicy,even for me. Husband would not eat it. I still loved it. Tonight used chicken thigh meat,bite size pieces browned. Then used drippings to sauté onions,corn & garlic. Replaced rice with pre-cooked farrow. Used canned diced chilies. Awesome-can’t wait for breakfast so I can eat more!! I love that you used leftover turkey- so smart! So amazing, I made my own salsa verde instead of buying it , I’ve made this twice my husband just loves it, thank you so much for sharing this recipe. 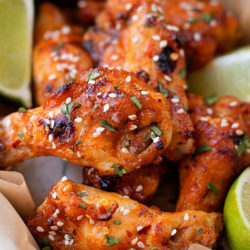 This is such an easy but flavorful recipe. The hatch chilies totally make this recipe. Hi! I made this and majority of the broth is gone. Do you know why this could have occurred? Maybe the rice? Did you rinse the rice prior to putting it in? Could you make this in the crock pot? Plus, what about using pork? My fiancé is allergic to chicken/poultry, so, substituting things would be a must. Hi, I am writing from New Mexico. Hatch is a staple here. We like to bring home whole roasted chilies from the grocery store where they roast them in a large roaster in the parking lot while you wait. We freeze batches for later use. I made your stew with turkey [boiled the carcass from T-Giving]. Awesome! This was absolutely delicious. I used rwo cups of frozen mixed vegetables because that was what I had on hand. Also added a few dashes of worcestershire sauce and soy sauce based upon similar recipes I had read. Also thickened with a slurry made of one cup milk and one half cup flour. Added already cooked rice and let everything simmer. Incredible depth of flavor. This is a keeper! Made this yesterday with homemade chicken stock and Hatch green chiles I had roasted and froze this past summer. It was so good. My son and I devoured a bowl and came back for more. As with most stews I know this will be even better the second day. Can’t wait till lunch!! Any directions for an instant Pot conversion? I’m doing weight watchers and need to know how to count this. Love this soup! Just made this and oh my gosh … yummmmmm! Will be printing and adding to my cache of keepers. I did make a few slight changes … I replaced the corn with hominy and replaced the rice with diced potato. Just my personal preferences. Thank you fr the fabulous recipe! Made this tonight! Beyond amazing! I added zucchini and a little more rice, the salsa verde I used was spicier and it turned out soooo good! I topped it with avocado, lime and cilantro and it was perfect!!! Loved this soo tasty!!! Will be making A lot in winter right now it is 100 plus degrees but the soup was so good I made it twice in a week just craved the great flavors and it being August I bought the Hatch chili’s and was looking for some good recipes. This is a real keeper. Thank you Carole, so glad you enjoyed it! Going to try this for a Sunday School class party. I purchased and processed 25# of roasted Hatch Green Chilis a couple of months ago and I am always looking for a new way to use their amazing flavor. I didn’t have fresh corn so I decided to used canned instead. I accidentally opened creamed corn and decided to add it in with a can of sweet corn. It is so amazing. It made this delicious soup creamier. I will definitely make this again. Thank you so much. So will one 4oz can of chilies work or two? 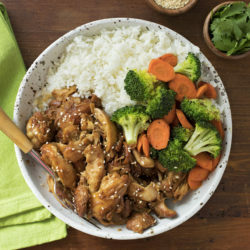 Does the rice need to be pre-cooked before adding to the stew? Please reply! I am making this for the first time for a potluck at my office. It’s a new job and I want to impress! Thanks!! Nope! It will cook as the soup simmers. Made this on a snow day, and what a treat! Since we couldn’t get to the grocery store, I used 2 cans of Costco chicken and a can of corn. Luckily, I still had some Hatch chile in the freezer, and a jar of green salsa in the pantry. Everyone wanted a second helping. Thanks! You are welcome! So happy to hear you enjoyed it! This is excellent! Since I couldn’t get Hatch chilis I roasted some Anaheim chilis and they are a great substitution. I also added some great northern beans instead of the rice. This is definitely a keeper. The spice is spot on. Yummo!! This recipe is outstanding! So tasty and so quick and easy. With jarred hatch chiles, it basically becomes a dump-and-cook meal, except for some quick chopping onions and shredding. This is going to be in my year-round rotation. I’ve made this recipe several times and it’s always a crowd pleaser. I usually use a rotisserie chicken and while they vary in size, I find that using one, to one and a quarter pound of the meat will suffice. This last time I made it I couldn’t find Hatch green chiles. I substituted a small can of jalapeño instead. It provided the heat but didn’t have quite depth of flavor of the Hatch Chile.